If you've tried repelling, excluding, and scaring away a pest animal and it's still causing problems, you can trap and release it, or use a lethal trap. Trapping is an effective way to remove a specific pest animal, but isn't useful against a large local population over the long run. In the latter case, trapping should be done in conjunction with exclusion, fencing, or altering the habitat. It's best to call your local wildlife officer or professional pest removal company to handle problem animals. However, if you're willing to do the dirty work yourself, here are some tips to follow. Minimize signs of human activity. Handle traps as little as possible and mask your scent by wearing gloves. Make sure the trap is the right size and sturdy enough to handle the animal you're after. Anchor the trap so the animal can't roll it over and escape. Bait the trap a few times before setting to teach the animal that it's a safe to approach it. Make a trail of goodies to the trap, and pile some in the back or on the trap for the critter to find. Disinfect the trap with bleach after using. Rabies is transmitted by saliva, and you don't necessarily have to be bitten to contract the disease. Place plywood under live traps to prevent animal from scratching up the lawn or garden once they're caught. Use caution when releasing large animals (e.g. raccoon, skunk, woodchuck). The safest method is to tie a strong rope to the trap door. Run the rope through an open window into your vehicle, so you can pull open the trap door from a point of safety. Check traps daily, and release or bury animals as soon as possible. Live trapping and releasing animals has become popular. It seems no one really wants to hurt those fuzzy, furry, cuddly creatures. But in some cases live trapping can be more cruel than killing the animal. Relocated animals frequently become disoriented and aren't able to fit into their new habitat, often starving to death. If you use live traps, contact the Humane Society or the local or state game officer to determine the best method, time to trap, and way to release a wild or nuisance animal before setting the trap. Some species are protected from trapping by law in various states. Once you've caught the animal, be careful. Wild animals can carry diseases such as rabies. Frightened skunks will be more likely to spray, and an agitated woodchuck will nip in self-defense. Here are some tips for trapping specific animals. Bait the trap with nuts, peanut butter, rolled oats, or seeds. Set traps near a food source (e.g. a bird feeder) or along a runaway such as at the base of a tree. Use metal traps, as rodents have sharp teeth and can chew through wooden traps. Check traps a few times a day. Lethal traps are more commonly used on gophers and moles than live traps. Trap in spring and fall when these critters are most active. No bait is needed; just place the trap in a main tunnel and disguise it well. Wear gloves so you don't contaminate the trap with your scent, and cover the tunnel with soil. Move traps within 2 to 3 days if you haven't caught anything. Bait with sardines, marshmallows, cat food, or corn. Place the bait in the back of the trap so it closes properly. 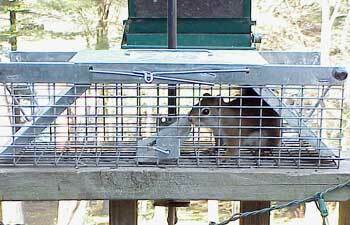 This will prevent these chubby varmints from backing out of the trap after eating. Place the trap near a food source, (e.g. your ripening corn patch) and keep it strongly anchored. Use caution when you release the animal. Skunks are attracted by fishy smells, so bait their traps with sardines, fish scraps, or seafood-flavored cat food. Cover the trap with a tarp, since skunks like to explore dark areas. If you're using a live trap, the cover will also protect you if they loose their spray. If you're unfortunate enough to get sprayed, wash yourself and clothes with tomato juice, vinegar, hydrogen peroxide, or deodorizer made from orange-peel extract to remove the odor. Beans, lettuce, carrots, and apples are some favorite woodchuck foods. Place the trap near their burrow entrance when you first sight them. Trap only in summer. Spring trapping may orphan a burrow fully of young, and in the fall as they are readying to hibernate.